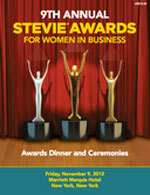 The Stevie® Awards have just published the full PDF of the 2012 (9th annual) Stevie Awards for Women in Business awards dinner program online, at http://www.stevieawards.com/uploads/file/SAWIB12Program.pdf. The program will be distributed to all attendees of the November 9 awards dinner, and to an additional 10,000+ executives over the coming year as a download from the awards' web site. Can't make the awards dinner? Download the full program here and listen live to the 9th annual awards presentations on November 9th from 7:30PM EST on Business Talk Radio Network.